This is the first in a month of Christmas Floral Class posts. I hope they give you ideas for your tree and table. There are great sales for silk flowers so it is the perfect time to buy. Yeah, you have permission. 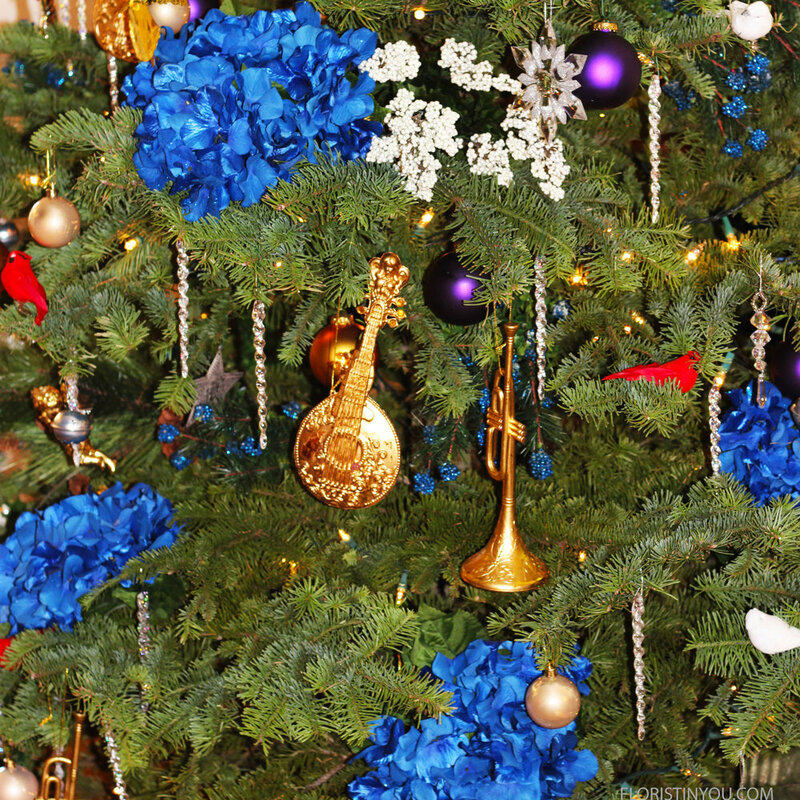 The little gilded instruments give the tree an antique look with Baroque style mandolins, trumpets, guitars, and angels. 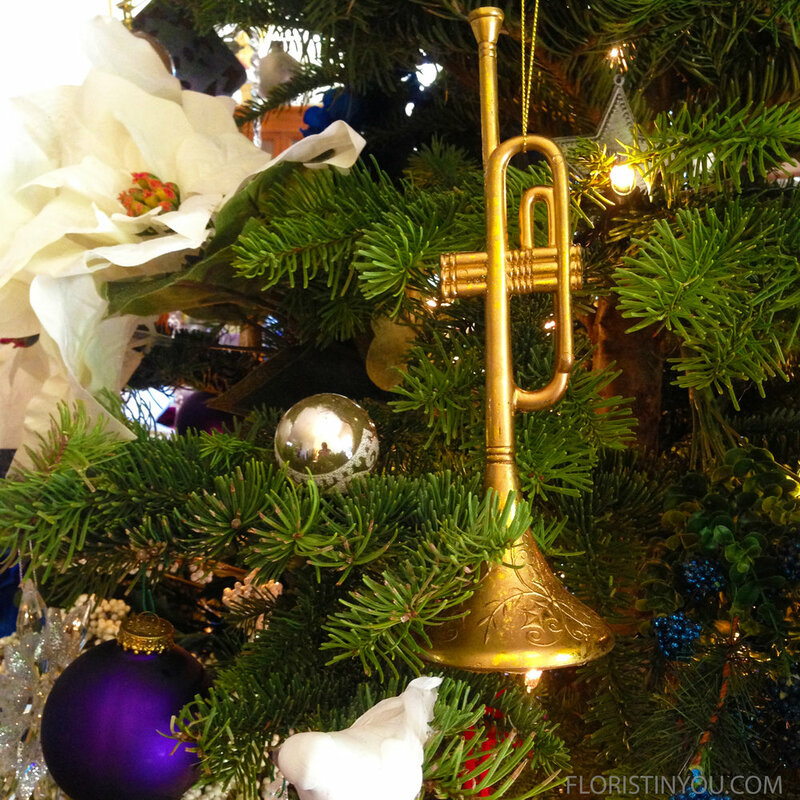 I found the gilded instruments at the Los Angeles Flower Mart in Floral Supply Syndicate and the gilded angels at an antique shop. 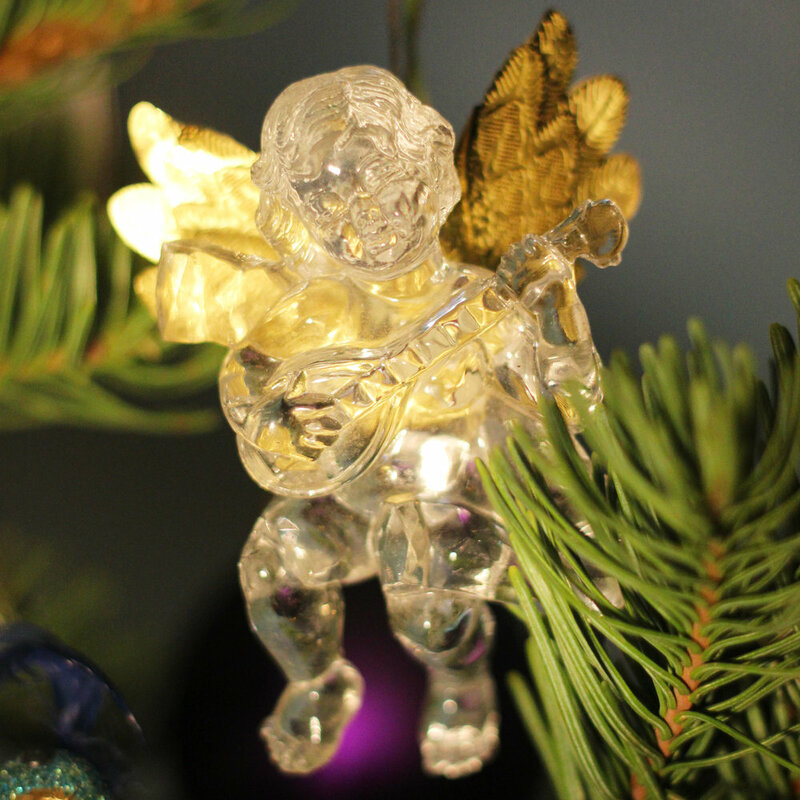 The angel topper is also a family 'antique' of sorts. My daughter painted her with watercolors and cut her out about 20 years ago. There is a tab in the back to close her skirt, so we just carefully flatten the skirt and keep her safely tucked away for next year. So get sheets of watercolor paper and have your little angels paint a lovely tree topper and decorations instead of buying them and you will cherish them forever, I promise. I have also included photos of unique and fun homemade gift cards. You can cut the white card backing out of card stock, and use photos of birds, and cut out feathers out of old maps to decorate the tags. You can attach these with 1/4 inch sheer blue ribbon. Get some Christmas ribbon while you are out shopping and you can also make your own bows too. 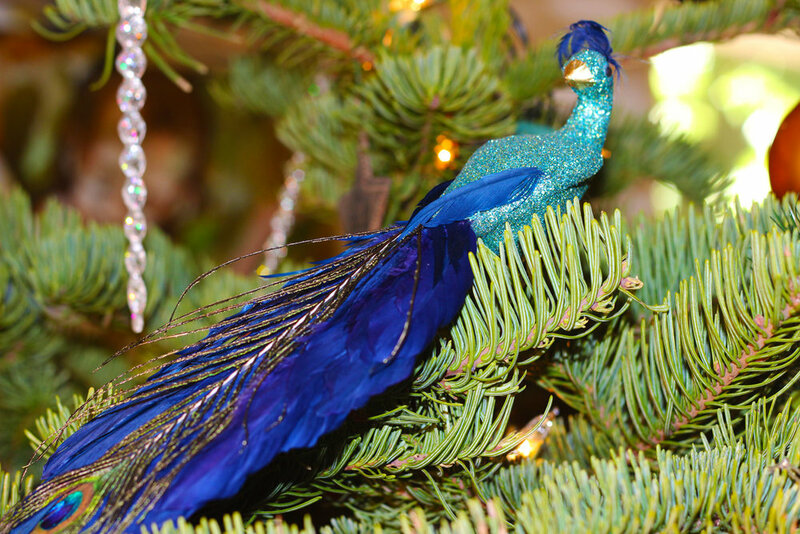 So, if you've had your shopping spree, it's time to decorate the tree. Are you ready? Start by putting a couple sets of small white Christmas light evenly around the tree. Next lay the hydrangeas on top of the boughs. Add the white berries and faux blue raspberries. Add your white poinsettias and Christmas balls. Find a roost for your peacock. This nativity in made form olive wood and is from Bethlehem. This is what it is all about. Now bring out the musical insturments one by one...the mandolin. This one is playing a mandolin. This one is playing a flute. And this one is playing the violin. They look celestial, flying around orbs of light and color. 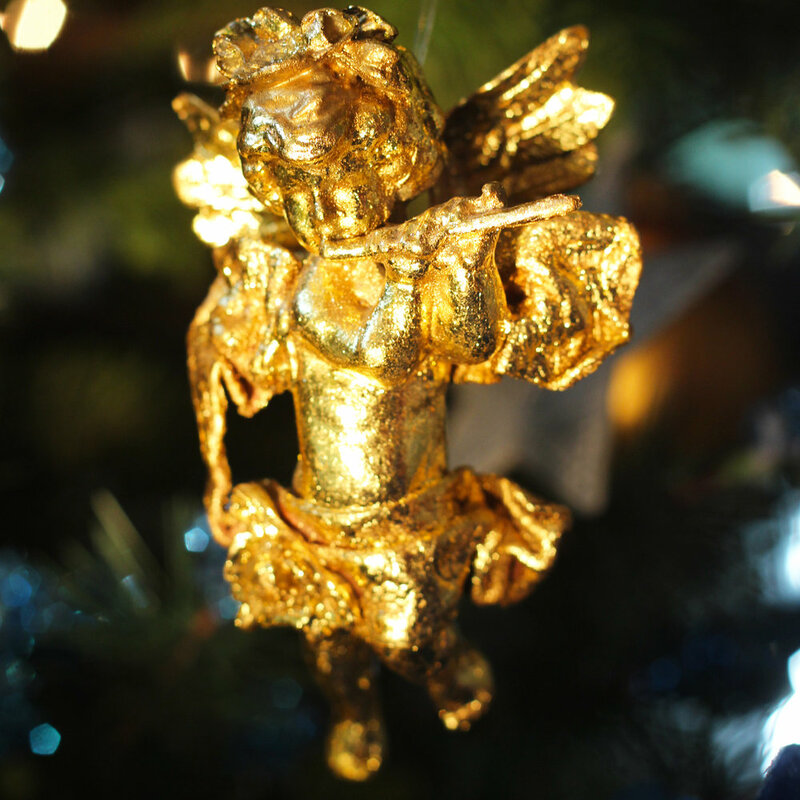 Have your kids paint a watercolor angel topper and ornaments. And your other tin ornaments. Make your handmade gift tags. The handmade bird cards on old fashioned tags add charm to your gifts. 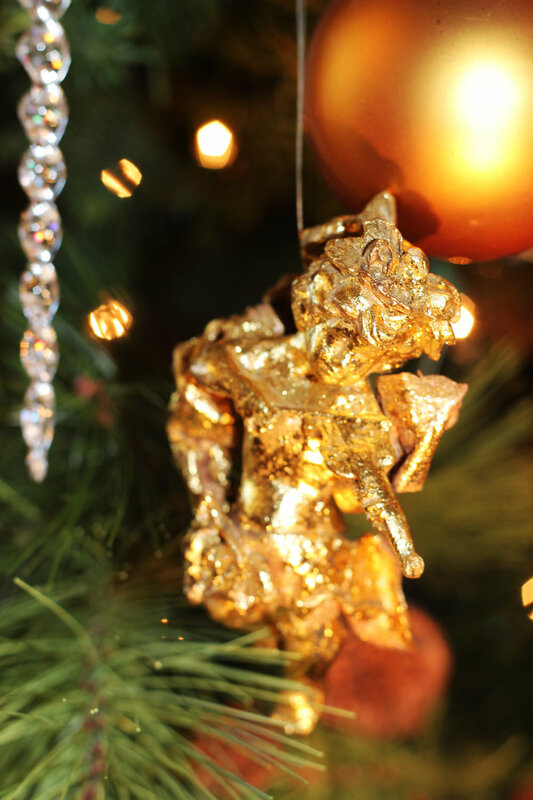 Your tree will be ready for Santa. Enjoy!